Léon Jean Basile Perrault (1821 – 1908). Léon-Jean-Bazille Perrault was born in Poitiers in France in 1832. He studied under two master painters in the nineteenth-century academic style: his teacher, François-Edouard Picot, and his friend William Bouguereau. He exhibited in the Paris Salon from 1861. 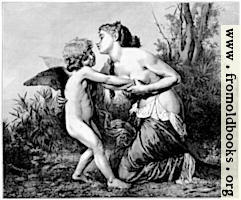 Perrault is known today mostly for his sentimental depictions of cherubs and naked children with innocence, vulnerability and beauty.